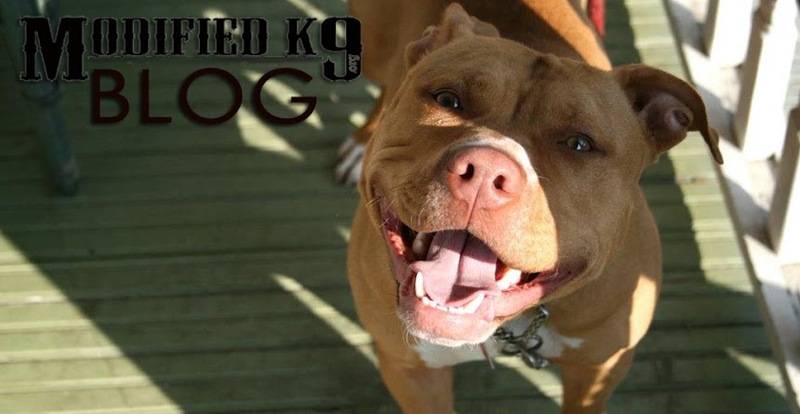 Here at Mk9, we receive a lot of emails and messages about Pit Bull and Pit Bull type dogs. News reports and stories from all over. From both sides of the spectrum as well. The good, and the bad. When we find the ones we believe will do good to help further the education of the general public, we "Share" them with hopes that people will be influenced, and motivated to see Pit Bulls and their owners for what they are, and not what the Media would make them out to be. I'm a Police Officer in Baltimore City. 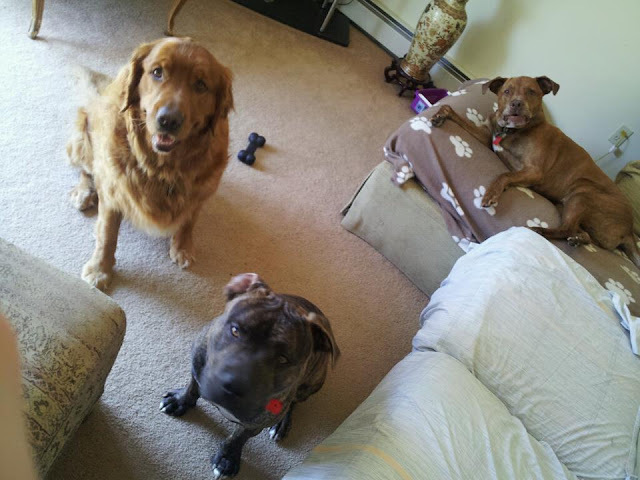 I am originally from Wilkes-Barre, and I am a fan of your organization and Pit Bulls. Today I received a call while on duty about a vicious dog chasing kids. When I came on the scene, I noticed people yelling out their windows at the dog. I followed the dog into an ally to see how it was acting. Going on my own approach, being a dog lover, I got out of my car and called the "vicious dog" over to me. The dog came over with it's tail between it's legs and panting. I grabbed my water bottle and the dog sat down next to me and began licking my pants. I started giving the dog water. I brought the dog over and waited for the pound to show up. My partner was not a fan of dogs and was startled by my approach. I suggested to him that this dog cannot be put down, and should be taken to a shelter. We took it upon ourselves to take the dog to the shelter, and transported it in the back seat in the back of our patrol car. Then I decided that I wanted to keep the dog, and spoke to the shelter about the steps to take to adopt it. The dog was originally kept outside and was filthy, and now it just might have a new home. I know you like positive pictures so I have attached a few. Have a great day and keep up the good work! Instead of assuming the dog to be vicious and shoot it dead, (as we see so many times before) he analyzes the situation, and sees a nervous dog that needs help. Instead of letting animal control pick up the dog, and let it disappear, or be put down, he personally takes it to a shelter, IN HIS CRUISER!!! Finally, he offers the pup a new forever home! So we at Mk9 would like to say Thank You! Officer Dan, for taking the time to be patient and give a dog a chance. And step outside the stereo types and see this for what is was. A loose dog who was nervous, and needed someone to help. Not someone to yell at him and assume him to be dangerous. Here is "Bo" with his new family. A perfect picture of a perfect ending or an amazing new beginning. i loved what you did officer dansome people think pitbull's are mean dog's but there not it's the owner who make's the dog mean.and it how you treat them so if you hit them and kick them and scream at them that makes them mean. Thanks Officer Dan for giving the dog a chance. I am also from Wilkes-Barre but now live in Virginia. It goes to show that people from Wilkes-Barre Pa Rock! Thanks again. Be safe out there. Officer Dan, you are my HERO! What a beautiful example you set. Makes my heart happy! What a great outcome for everyone and hopefully his partner learned something as well. Awesome.........Keep up the good work. Just look at him in the squad car! Does that look like a nervous dog? He's full of LOVE! Why assume the worst? Were the kids scared? I bet not. Yep! This is another one of those vicious pitbulls! I DON'T THINK SO!! Just look at that picture!! This dog is so thankful to find SOMEONE who cares! He will be loyal to the end Dan! Thank you Dan! You are a perfect example of keeping our communities safe! ALL of our communities! Dogs included! This picture just made my day!!! Thank you for your service Sir!!! Way to go Officer Dan! You have restored my faith in good cops. I'm so glad you were the one to respond and rescued this precious boy. I salute you!! I am almost one hundred percent sure that Bo is a staffordshire terrier, and not a pittbull. I have a staffie, and they look veru similar. Absolutely brilliant ! An Officer who reaches out with kindness instead of a gun ! @ Nancy K.- i don't believe the kids are at fault it the parents people so afraid of dogs to this day it sad. I´m deeply impressed, Officer Dan! THANK YOU from the bottom of my heart, and tail wags, and sloppy dog kisses from SE Ohio. It is so good to see a positive story with a Happy ending. May you both have many safe and happy years together, and I re posted on Face Book. Bless you, wish you could educate other cops to think, instead of shoot first!! I wish you many years of happiness with all your dogs! You are what being a policeman should be all about, helping the public and justice for all. I salute you Officer Dan, and echo the sentiments of starting a training camp, for the lesser patient officers who draw their weapons, when the dog might just be barking for love, attention, and WATER. This Officer is from Wilkes-Barre, Pa, where I live. We have good, dog loving people in Wilkes-Barre. Police Officers all over can learn from this experience and not judge the breed before analizing the situation. To many times, police pull thier guns out and shoot before they even try to see if the dog is friendly or hurt or scared. This is one very good Police Officer and I'm proud to say he's from my hometown! Excellent work, Officer Dan!! Thank you for saving this guy's life! Sounds like some public service messages educating not only fellow officers, but the general public are in order regarding dog behavior. You're a wonderful example! This wonderful young man will go places, a asset to the Police dept. Used his head and not his gun to fix the situation. Kudos to him. MAJOR Kudos to Officer Dan! Not only did he take a humane approach with the dog, but he also did not pass judgment on what might truly have been happening (the dog MAY have been trying to play)!!! I almost cried when I read that he also wanted to keep the dog himself! WONDERFUL! It is so cool that he was able to show his co-worker, through his actions, that there is always a good side to be had in every situation if it is handled correctly! I LOVE the picture of Bo with the other dogs, and the picture of Bo giving his thankful kisses to Officer Dan! Those pictures speak volumes! LOVE IT! I wish all law enforcement officers would be trained on what to look for in cases like this. So many wonderful dogs could avoid an unnecessary end..
Way to go Officer Dan! Keep up the good work!! Officer Dan should do a nationwide training course......Awesome work!!!!! Awwww Officer Dan, you are awesome! I hope Maryland doesn't pass put BSL into effect! Glad this baby is happy in your home! LOVE this story! Thank you to officer Dan for using his skills to assess the situation and not shooting first and asking questions later!! Thank you Officer Dan. We need more people like you. I co-mod a FB page about law enforcement shootings of dogs, and we LOVE this story. We see so very, very many stories on the opposite end of the spectrum, when an officer shoots a dog dead, sometimes in the dog's very own yard, merely for 'barking', for doing its job of protecting its own property, or just because the officer sees a pit bull and assumes it will attack so they shoot first and don't bother to ask questions later. So many times we've seen articles where a "vicious dog" was reported and instead of trying to find out what the real situation is, the responding officers just shoot the dog. Kudos to Officer Dan for not only stopping to assess the situation and find out what the real story was, but for being a kind soul who wanted to make sure this dog was taken care of. He is the type of officer we want to see more of out there. Hopefully the other officers in his department will take a cue from his outstanding behavior in the service of the public!! God Bless you Officer Dan, thank you from the bottom of my heart for showing sympathy to this animal. Two thumbs (paws) way up. Far too often, an officer responding to a "vicious dog" call story doesn't end well. Thank you, sir, for honoring your oaths to serve and protect. Yay, Officer Dan!!!! You should do training classes for your fellow officers, so they can be more like you in situations like this. Bo was extremely lucky to have you find him. He's beautiful. Thank you, Officer Dan. You are wonderful!! That story just gave me the very huge smile that I needed today! My heart feels so warm now! You rock Officer Dan!!!! I've seen this happen more than once here in Baltimore! We have some great police who love their dogs. Of course I LOVE this story and it is nice to see an officer use his brain in a situation instead of his gun. I wonder, however, because of the new breed specific legislation in Maryland if he is going to be able to keep this dog. I would hate to see this dog taken away from such a wonderful caring home. The court ruling is not in effect yet because there is a pending motion for reconsideration. Well I should hope so because it is a bunch of garbage. This is the most wonderful story I have heard in such a long time with regard to a police officer and pit bull. Please, if you would, thank this officer from all of us who fight for the rights of these types of dogs. It is so rare that we get to see anything close to this from an officer. Normally, we hear they shot the dog and our hearts are broken because 9 out of 10 times they are just like your new boy, just scared of all the people yelling at them and they don't know why. Thank you from the bottom of our hearts for caring and loving - you are an incredible human being and the kind of officer I want to protect me and my dogs. Love this!! Brings tears to my eye's just knowing another precious fur-baby was saved! THANK YOU!!! Thank you Officer Dan, Bo, enjoy your new home!!!! <3 this! What a HERO! Wish there were more like him! Restores my faith in man-kind. What a great officer- he should be given an award. Thank you officer Dan for correctly assessing the situation and the dog, then transporting him yourself and adopting him. You ROCK! I wish you much joy and happiness- this story made me happy! Thank you Officer Dan for taking the time to really know what is going on... Kudos to you!! !And thanks for saving Bo!! This guy is a real 'man'. Doesn't hide behind the uniform or the badge (don't get me wrong, I love most law enforcement people). Hubba hubba! So happy for the dog that this guy was the one to respond to the call. That made my day! What a lucky dog! Awesome! Wish there were more people and officers like you out there to give supposedly dangerous doggies a chance. Instead of immediately judging you took the time to assess the situation. Thanks from all of us dog lovers. What a great story, and a happy ending for all. Officer Dan, you're alright in my book. ;) thank you for your level headed approach to this situation, and for opening your home to this dog in need. Great job Officer Dan. Thank you for giving this boy a forever home! beautiful story. thank you, Officer. Officer Dan rules!! Now THERE'S an excellent officer! Way to go Officer Dan! I am the first to post when policemen do the WRONG thing well I will definitely re post this because it shows when they do the RIGHT thing!!!!! This dog was definitely in the right place at the right time..... Kudos to you! Nice, way to go Officer. Hero indeed! Thanks for using your brains instead of your braun, Officer Dan. Good luck to the happy family! Officer Dan,you are a hero in my eye's & we need more like you. Beautiful story and an even more beautiful man! Thank you Officer Dan for your compassion and understanding. You are a true hero in my eyes but even more important in Bo's eyes! God bless you....BTW....I was born and raised in Maryland and it is nice to see compassion in a state where there is very little! The best police officer story I've ever heard! Thank you, Officer Dan for being a wonderful person!! Bo is so lucky to have such a fantastic family now!!! Thank you from me, my soon and our almost ten year old pitbull (spoiled and not a vicious bone in his body)!!! i read this and cry!! i wish that lady that shot and killed my dog was like this...she was an officer with the sheriff dept here...and trust me i have a 110 lbs pit bull that was raised by my pekingese and yet neither one of the would bite a flea but my 17lbs pekingese went outside with me and she shot him in the head with me 5 feet from him! way to go officer dan we need more of u around!!!!! Dana - that's truly heartbreaking. I can't imagine what fear someone could possibly have of such a small gentle dog. I'm so sorry for your loss. Reading Officer Waskiewicz's story gives me hope that things will change. Wow.....thanks for sharing the story Dan. You should help educate your police force on how to read dogs body language and how to approach/deal with them. 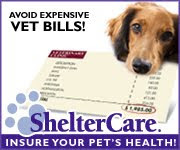 You could save many lives and the grief of many pet owners. Congrats on the new family member! My Husband has told me that it's shocking how LITTLE training some departments give when it comes to animals. He has told me that sadly, allot of Animal Control Officers are thought of (And paid as) nothing more than "Ticket Writers". I was REALLY UPSET to learn this because of the face that we live in a livestock community. We lived in one of the largest counties in Texas & it only had a hand full of Animal Control Officers for the WHOLE COUNTY! So that really makes Officer Dan a REAL hero for using his better judgment to make up for any lack of training. Everybody better be careful!! That dog might lick him to death!! Hehe!! These are the stories we should be reading more than those horrible ones about officers shooting dogs dead when they no idea IF the dog was attacking or not! Officer Waskiewicz needs a medal for setting such a fine example for other police (and everyday citizens) to follow! Has he thought of taking Bo to schools and such to show how good pit bulls are when they have the right humans in their lives? I think the two would do wonders to help open the eyes of children (our future animal protectors) and adults alike. Does Officer Dan have a girlfriend? Haha. LOVE this story! Thank you Officer Dan for giving this "vicious" dog a chance at a good life with lots of love !!! In recent days I have read so many disturbing stories involving officers KILLING dogs,most of them being INNOCENT,so its GREAT to finally read something with a positive,happy ending. Im sure the ONLY "vicious" attacks your going to get will be filled with lots of drooling kisses !!!! LOVE THIS SO MUCH!! My Husband was a Texas Peace Officer & now is a Houston Fire Fighter. Not only does he take our bully mutt with him to the station, when he makes EMS calls & there is a bully on scene, he always makes sure it is handled properly. Sadly, he does make "bite" calls & once "got in to it" with the officers on scene because of the way the dog was being handled. He is a REAL hero because he cares about ALL LIFE in need of his help. This world NEEDS more REAL MEN like Officer Dan & my Husband! WONDERFUL story!!! Yay Officer Dan!! Bo just hit the jackpot. Thanks for using your powers for good Officer Dan. Officer Dan Waskiewicz, not sure if you'll read this or not, but I caught this story off facebook. Big props to you and a job well done. This story makes my decision a little easier. I will be testing in Baltimore next month and look forward to the opportunity. I am driving from Cleveland, Ohio. If your department hires officers of your esteem, I have big shoes to fill. A job well done and maybe some day I will be able to say so in person. This story makes me proud to say that good people come from here in Wilkes-Barre, PA. They call this area "The valley with a heart" and this proves it. An innocent dog was spared due to a great officer using not only his head, but his heart. HERO!!! Way to be Officer Dan and way to exemplify what true enforcement should be about...should always be positive, no matter what the circumstances. I appreciate and acknowledge you for such excellence! This should be mandatory for all officers! Perhaps you could start a nationwide business by training all officers on how to handle our 4-legged loves! Thank you!!! Thank you for your actions and for sharing your story as a wonderful example, Officer Dan! Keep up the good work. Awesome Officer Dan! I wish I would hear more stories like this one instead of the one I heard on the news AGAIN today...2 PIT BULLS Attack!! Ugghhh!!! Thank you!!!! You are an awesome Officer. just last week officers responded to a home to tell the family their Loved one was just shot and killed. As the officers approached the dog (put bull) came charging around from the back of the house. the officers killed the murder victims dog. Family lost two Loved ones that night. I LOVE this officer!!!! Gives me renewed faith in policemen and humanity! Wonderful story. Thank you for sharing and WAY TO GO OFFICER DAN! THANK YOU OFFICER DAN FOR BEING A TRUE HERO AND FOR SHARING YOUR STORY AND PICTURES!! IT WARMED MY HEART! Finally a good cop/pit bull story! I love that he took him home! Way to go officer Dan! I got dispatched to a "vicious dog" call once, too. What a wonderful story! And one that truly brought tears to my eyes! God bless you Officer Dan for your compassion!! Officer Waskiewicz: Thanks for performing a difficult job with such compassion and honor. I will be the first to admit that recent dog shootings and the callous response by many police departments has seriously eroded my trust in the men in blue. Thank you for reminding me that there are plenty of good men and women who pull on uniforms every day and serve with distinction. Here's wishing you and your new family member all the best! Kudos to you as well, Officer Williamson. Warms my heart to see officers protecting our animals, who can't speak and don't always understand our words or intentions. They rely on our peace officers to use good judgment and assess a situation for what it is. Thanks for your enlightened service. In the midst of all the senseless and tragic stories of people stereotyping is so good to hear a story with a happy ending. This renews my spirits and belief in mankind. Thank you. Is he married? Because I am in love. Thank you Officer Dan! All the stories of police shooting dogs makes me scared every time I see a police car while out walking my dog. Nice to know there are good people out there who care about their animals. 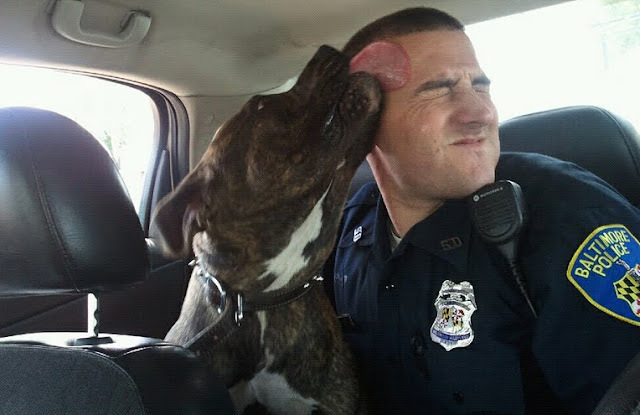 LOL Officer Dan, be very careful of that VICIOUS LICK YOUR FACE OFF PUPPER you just rescued!!! I have one I rescued also, we are working towards the goal of getting his TDI! It took me two years to find a facility who was willing to train us b/c I have to use an electric scooter. Oh I forgot to mention his vicious wagging tail...it's like a bull whip, it's always wagging too! He literally spoons with me when we go to bed at night! Congratulations on your new furkid!!! Not sure what is it with you cops, but check out Lilly the Hero Pit Bull, she is furkid to a Boston Police Officer & her story is AMAZING!!! She has her own FB page, but you can also Google her. Give your furkidz some soochies, belly rubs & ear scritches from me & a big hug to you!!! Please tell him to run for President. Now. Wow!! This story gives me goosebumps!! Way to go officer Dan! Can you rent yourself out to other agencies and help them to see what you saw! Officer Dan, nearly every day I read horrible news stories of police officers shooting dead any kind of dog that comes anywhere near them under any kind of circumstances. I've been reading so much of it lately, that I'd given up hope of any police officer understanding or even liking dogs. And you've given me hope! You are totally a hero for adopting Bo, as well as talking your partner out of killing him. Hopefully, you've planted a seed in your partner's mind for next time there's a dog in trouble and you're called to help. Maybe, from your example, he'll see the value in a dog's life rather than seeing a dog as just something dangerous and scary to kill. I read Radley Balko's puppycide stories. It's too bad this is news, but it is, and it is very welcome good news. Glad to read it. Well done Officer Dan, May God bless you and your family alway, you did such a good thing. We take our hats to you. Thank you Officer Dan ! Hahahahahaha!!! WTH!? They all looked at the camera. Dan had raised quite a few photogenic dogs, it seems. So funny and cute. I honestly think the police should ONLY send policemen who are dog lovers OR had taken a lesson about dog's behaviors when there is a call about dogs. Because those who're used to dogs will be able to evaluate the situation more fairly and calmly. Scares me to death, mine would look the same, but around here we dont even have shelters, never mind officers that care for animals! Thank you Officer Dan for actually evaluating the dog! Mine thinks babies taste the best and must kiss them all over, and children and women are his favorite playmates so he always wants to play chase or hug the women with his front paws around their waist. Without officers like you, if he ever got out without us around, that would be the end of him. Whenever we go out for our walks I introduce him to whatever neighbors are out so they know if they see him galloping their way he just wants lovings. Thank you for sharing your story & bringing hope and education to all! You're a good man Officer Dan! What a wonderful person you are Officer Dan. Thanks for sharing your and Bo's story. So much has to be done to stop peoples ignorance about "dangerous" and dogs in general. Thank you for caring, all dog lovers applaud you! I was abused by apathetic police in the past when I committed no crime and I had a lot of hatred for cops. This brought tears to my eyes. I'm sorry for hating you when I did not even know you, Officer Dan. I hope one day the world can move past hate, violence, and apathy. We should all find the Officer Dan within ourselves and nurture that side of ourselves and let it grow strong. What an awesome story! We need people like Officer Dan in law enforcement around the world. The picture of Bo licking Dan's face in the cruiser put a smile on my face and the story is a caution to law enforcement not to go in with closed minds and guns drawn. Training on dog behavior and how to tell if a dog is vicious or not should be mandatory nationwide. That is so Wonderful! I wish there were more like you!!! This makes me cry to think how easy that was and why more is not done that way. Thank you, Officer Dan, for being the best of what we hope for in humanity. Thank you for seeing with your heart and for taking in that frightened dog and making him a member of your family. You've given me exactly what I've been needing - a reminder that there are truly good, amazing, wonderful people in the world. YAY OFFICER DAN!!!!!!!!!!!!!!!!! It's not the breed, it's the owner that makes the difference! Way to go! I wish there were more guys like him out there. We need all the good guys we can get. Thank you for your common sense and heart of gold. you are a angel of god officer.you have a heart and feelings.you have good judgement and not a cop who pulls a gun for no reason to kill an innocent dog.this world needs more cops like you.I commend you for being the man you are.it eats me up inside,that so many people out there don't care,blame innocent dogs who are victoms themselves to the awful,,rotton abuse,torture and endless horrific killings.all these people scream and act like they are terrified,and they know darn well what goes on with these poor dogs,they know these poor dogs don't even have a chance in the wrong evil,inhumane hands.they have no reason to scream.alot of them are part of what happens to these poor dogs.I commend you so much officer,for not just pulling out your gun and killing this innocent dog.all of them are innocent,untill they end up in the wrong hands.but then what could anyone expect?if you,I or anyone were treated as bad and awful as these poor dogs,we would be angry too.it's so sad that these poor dogs are victoms themselves,and become victoms every single day,and suffer to the max.and yet they are the ones that get the blame for it besides.and then like poor parrot the dog,innocent as any other,who a cop just came along and thrw to the ground,put his knee in the poor dogs back,broke his back,threw the poor dog down a flight of cemment stairs and shot him dead.the dog did nothing wrong.god bless you sir,and I am proud of you and respect you.you are a blessing from god.thank you for saving an innocent dog. Wow! I love this man. THank you so much for not reacting - as most folks do, but thinking with your heart and realizing that this boy needed some help. Thank you for everything that you did. We need lots more just like you! In this day and age when all we seem to see in the media is stories about cops shooting dogs it is refreshing to finally read a story in which a cop had some common sense and did not shoot the dog! kudos to this officer for acting rationally in this situation as so many other cops seem to fail to do! Officer Dan, I wish you could be cloned and distributed all over the United States. Too many times we see officers do the EXACT opposite of what you did: they assume the dog's vicious and shoot it dead without even bothering to stop and think. Thank God you were the person who answered the call! I wish more officers out there understood dogs. It's also a good thing that it was you, and not your partner, who responded. Not only did you assess the situation and see a scared dog in need of help and proceed to help, but you saw a GREAT dog and decided to bring him home! What a GREAT guy you must be!! And the award for human of the week-officer Dan!,well done from the uk and all dogs worldwide,perfectly handled,a shining example of doggie understanding! officer Dan for sherrif! Way to go! Its nice to see the police officer had the Common sense and te proper education to examine the situation. A true good heart! Great story! Thank you Officer Dan. We absolutely need more of you on the force throughout the nation! What a wonderful story! Just goes to show one that not only are Police offices great people, but so are most fur babies. That's for sharing this heart warming story! My hero! Want to come work in our town? We could definitely use someone with a cool head and warm heart like you in TN!!! You're definitely an amazing hero! Thank you for your service Officer! We need more police officers like you! This story is perfection in every way! We love you, Officer Dan! Thank you for taking the nanosecond of thought to realize the actual situation and take the appropriate action. I'm so happy that you adopted that cutie! We need more officers, no, more people like you in this world! God bless you! Great story. Thank you Officer Dan for being the type of human being a dog deserves. Officer Dan - you are an inspiration! Thank you for your incredible compassion. I wish every police officer and every pet owner was like you. What a great story to brighten my morning. We need more police officers who are dog lovers like this gentleman - such an appropriate and wonderful response, and such a happy ending for this pup! Thank you for sharing! I LOVE this!!! There needs to be more great people like you in this world! Thank God for you!! You have a gorgeous family. You should be proud! Thank you SO much Officer Dan! Now please teach your tactics to as many officers as you can. You are amazing! Def a perfect new beginning! Thank you Officer Dan! For a Baltimorian with a pitbull, I appreciate you more than you could ever know. THANK YOU OFFICER DAN! Perhaps you could give lessons in compassion to other officers, or at least teach them to look and analyse first instead of just shooting first! Great job! Officer Dan - you do Baltimore proud!!!! I love this story and am so glad that the dog wasn't shot. but I am curious if anyone tried to find his owners? Thanks go to Officer Dan Waskiewicz, it's good to read a good story just for a change, brightened my day! Wonderful story - thank you so much for sharing! Too often we hear only the negative opinions of so-called "dangerous" dogs or the argument of who is to blame. It's refreshing to read about the instant connection between a man and a dog, and a moment of trust that was so pure, so simple, yet so profound. I especially love that he gave the dog a choice, calling him and letting him decide. And it's incredible, that as frightened as the dog was, that he was able to focus enough to recognize a safe place. It's great to know that there are police officers out there that DO actually think before they act, and that have real world knowledge of pit bulls and don't just work off stereotypes and rumors. Officer Dan should be commended by his superiors, the ASPCA, Humane Society, and other groups for going above and beyond the call of duty to save the life of a dog he knew wouldn't stand much of a chance otherwise. There is hope!! After reading some stories from a semi-local paper where a "pit bull" (actually a pit/boxer mix) was shot by a shot gun, it makes me very happy to read about this officer's reaction. As an owner of 2 pits, it makes me even happier! Way to go, Officer Dan!! I will be in Baltimore next week Officer Dan! Would love treat you and your partner to lunch for doing this! Thank you Officer Dan! 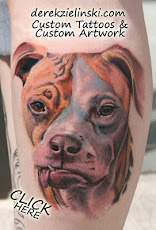 We see so many sad stories about animal abuse each day especially against the Pitties. It is such a sweet story, and I thank you for sharing! you are my hero, Dan. this message really made my day better :) hope there will be more kind people willing to understand all the stray dogs. wish you and your new friend all the best! If only EVERY BODY took the time,,this dog was one of the very lucky ones..well done Dan. Thank You Dan!. Thank you to be human and a good officer too. What a great person! Happy to read about this. Officer Dan truly is a HERO! Not only to people, but to animals as well! I lOve this story and have an idea from it. Officer DAN should do training for other officers on how to handle dogs in police calls. To many trigger happy officers these days. I would devestated if one shot my dog. Are you married? You are my kind of guy! Thank you for your compassion. Fate truly intervened, sending in the right man at the right time! What a great story, thank you for sharing! This made me happy today. Go Officer Dan!! Living in the DC metro area all we hear about are pits being bad, and most of the time I suspect the dogs being called pits aren't that at all, but it's the label they put on any dog acting aggressively :(. I own a pit mix and he's the sweetest love bug in the world! People need to be reminded there is a reason these dogs were known as America's nannies for decades. So thrilled to read that you, Officer Dan, decided to take the dog instead of shoot it (which happens WAY too often). Kudos to you and kisses from Rosie and me! Thanks!!! omg how sweet! 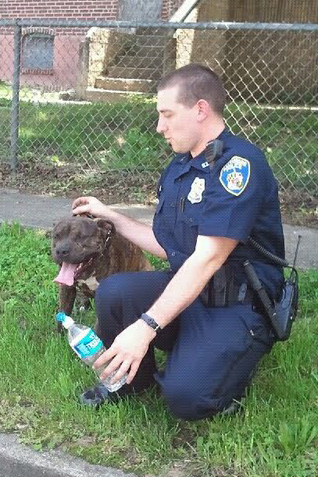 thank goodness he was found by his soul-mate :)Officer Dan giving cops a good name in Baltimore :) Bo is adorable!!! Thank you for sharing such a great story! What a wonderful story! I realize being a law enforcement officer is stressful, but I wish more of them would be open-minded when it comes to interacting with dogs, especially Pit Bull types. Hooray for the Baltimore PD! This is the most beautiful story that I have read in a long time. The world needs more people like Officer Dan Waskiewicz, he is a TRUE HERO!!! Wishing the entire "family" many love and fun filled years together. You officer...are a TRUE hero! Thank you for being a REAL MAN!! To protect and serve... nowhere does it say "humans only". Thank you for having such a big heart! Sending you much love and appreciation!! Keep up the good work, Officer Dan! You sure are a hero because of his work and because you saved Bo of a difficult life. The world needs more people like you! Congratulations from Brazil! Pit bulls are NOT dangerous dogs, but I think they are very sensitive to their owners and their environment. And there are a LOT of bad pet owners out there living in deplorable conditions. NORMAL PEOPLE do not fight their dogs. NORMAL PEOPLE do not use other dogs as "bait". To those that breed and fight these animals - you deserve to be in jail for a very very long time. Lovely story! Always remember to carefully supervise the dog while first introducing it to others, since you don't know his history. Notice if he is dominant, submissive, competitive. Any time you introduce a new dog to others, the power structure in the household changes. Supervision in this process is crucial. Wow! This story is just warmed my heart!! As a pit lover born and raised in Baltimore, I am so used to hearing awful stories about how people handle these "vicious dogs" and it saddens me. This story is the first story in a long time to make me proud!!! Great job, Officer!